The 2009 Chevy Silverado phases in a new six-speed automatic transmission, a bigger V8, an economical XFE model, and a gasoline-electric hybrid. Additional upgrades include a rearview camera system, a navigation system, updated wheels, OnStar 8.0 with turn-by-turn navigation and destination download, Bluetooth, and XM radio with real-time traffic information. The 2009 Chevrolet Silverado 1500 Regular Cab is powered by a base 4.3-liter V6 with 195 hp. Other available engines include a 4.8-liter V8 with 295 hp and a 5.3-liter V8 with 315 hp. 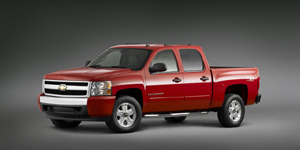 The 2009 Chevrolet Silverado 1500 Extended Cab is powered by a base 4.3-liter V6 with 195 hp. Other available engines include a 4.8-liter V8 with 295 hp, a 5.3-liter V8 with 315 hp and a 6.0-liter V8 with 367 hp. The 2009 Chevrolet Silverado 1500 Crew Cab is powered by a base 4.8-liter V8 with 295 hp. Other available engines include a 5.3-liter V8 with 315 hp, a 6.0-liter V8 with 367 hp and a 6.2-liter V8 with 403 hp. The 2009 Chevrolet Silverado 1500 Hybrid is powered by a 6.0-liter V8 with 332 hp.